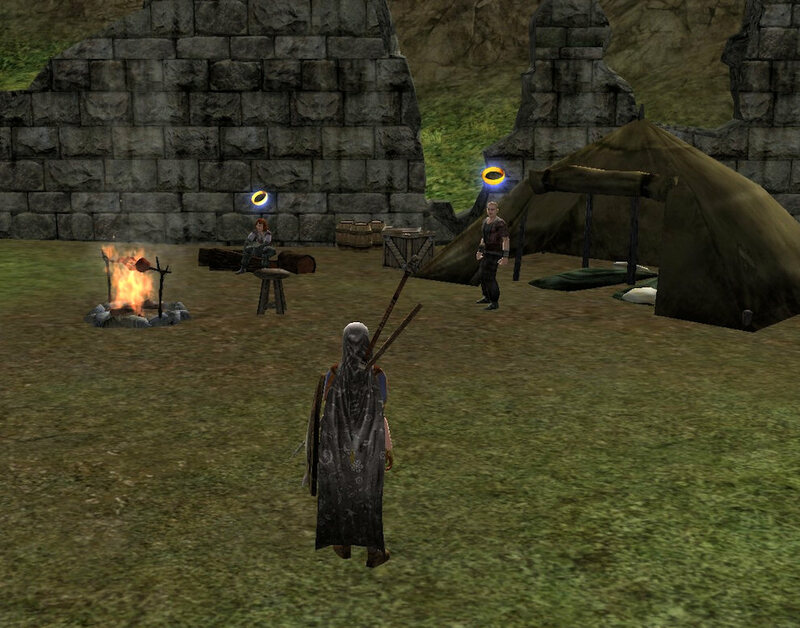 Some ways into the Lord of the Rings Online three year anniversary welcome-back weekend I decided to stop playing my current characters on Winfola and Nimrodel and start a fresh set on a new server. If we were going to move the instance group to Middle-earth again, we would probably want to start fresh, which meant that the 1-20 game was of more immediate importance than the skirmishes of things you can do later on. So I rolled up a new character on Firefoot. 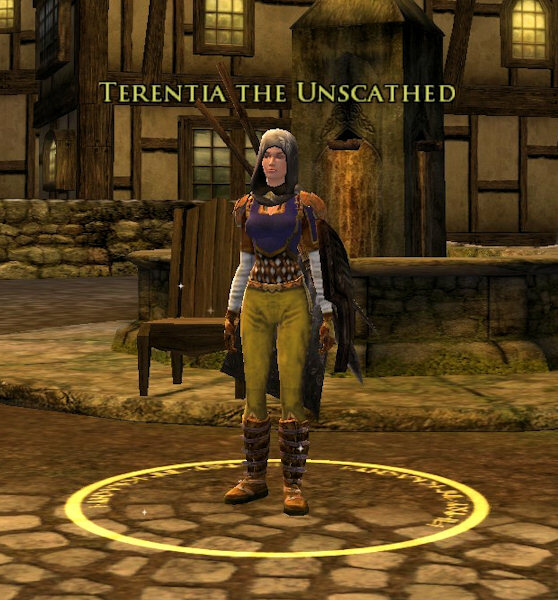 Now have one of my few female characters, Terentia the warden, named after the wife of Cicero. I later created another character, a hunter named Silinus (which sounded roughly Latin to me, trying for a theme here), to run though some of the starting areas again. I ended up with Terentia at 21 and Silinus at 15 after about ten days of relaxed play. They were both of the race of man, so I spent that time in and around Bree. And while I will get to writing up what I thought of playing an old favorite class, the hunter, compared with newer warden class, I will save that for another post. Here I want to remark on what I noticed changed since I last ran through these early levels. Over the last three years the experience curve for LOTRO has been reduced twice, at least by my count. While that has given a boost to some of my older characters, it also speed up the job of getting through those early levels and picking up skills. My earlier impression that they have added more quests seems to have been justified. There are definitely more quests than I remember from before. Of course, not all of them are original. More bears, more boars, more wolves. I got those along with a quest to head out to my favorite lake, Nen Harn, for snapping turtles. And, out there, I ran into more quest givers who were also looking for boars and bear and turtles, or parts there from. The quests an Nen Harn though gave rare crafting items and recipes as rewards, along with the usual experience and coins. And they were repeatable, in case you need more crafting items or really dislike the local wildlife and want to mix business with pleasure. Along with upping the ante with the number of quests, at least four quests in the Bree area that required you to wait until night fell in the game have been changed. No longer do you have to wait until the game’s own day/night cycle to meet up with Bill Ferny, the informant from Sharky’s men, or the shade in Bree. They all show up in daylight now. 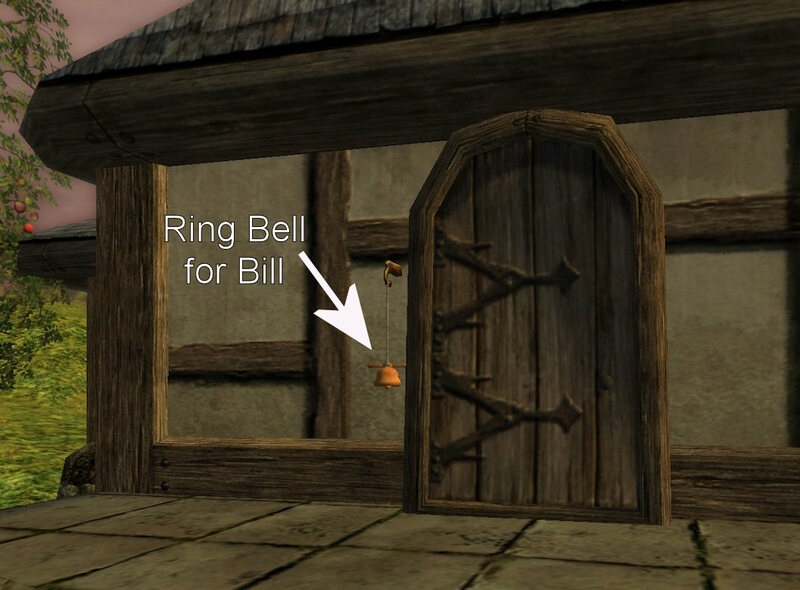 In fact, to get Bill Ferny now, you just go up to his house and ring the bell. 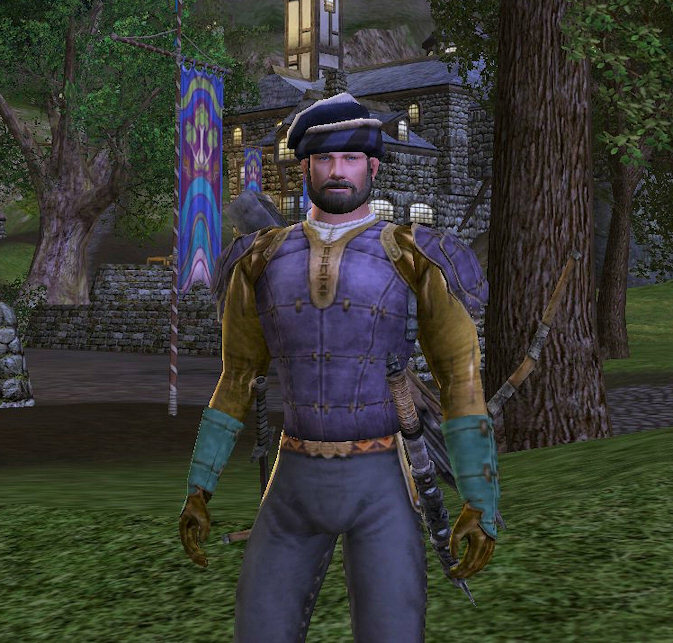 There seems to have been a big shuffle of quest giving NPCs at some point, most notably on the Bree/Brandywine Bridge axis, though it is noticeable elsewhere. While this ends up creating quest hubs, little clumps of “quest available rings,” which some people think are a bad thing, it certainly does reduce the amount of running around. The road from Bree to the Brandywine Bridge is 75 miles in the Middle-earth Atlas. How many times should we be reasonably expected to run that route? In addition to some NPC optimizations, there are new (to me) intra-zone stable-master routes. These appear to be scattered along some of the more notorious routes you end up running back and forth along. Now for 1 silver you can ride from West Bree to Adso’s Camp or to Buckland, since they haven’t eliminated all of the running from that corridor. Perhaps even better, certain quests now provide you a ride to your next objective. Specifically, when you’ve run up to Saeradan in the North Bree Fields and he turns around and tells you to head all the way back around to the Lone Lands to Candaith’s Encampment, which is stuck in a dell in on the bad side of Weathertop, he at least offers you up a ride now. And even on his fast horse, the journey takes several minutes. The thought of having to hoof it all the way there used to be one of those “done for the evening” moments. This was actually just introduced at about the time I stopped playing before. It was being tested live back then. Now, however, it seems to be ready for prime time. It has its own quirks of course. It took me a while to figure out how to get the quest tracker in the mini-map to focus on the quest I was interested in, not just what it picked. Fortunately, somebody mentioned right-clicking on the ring next to the quest for a menu. Oh, hey, look at that! And when the quest tracker is on, it definitely takes a while when you open up the map. This is probably what you should expect when you add on a feature like that. But otherwise it is functional and has pointed me in the right direction often enough, though once in a while it seems to form strange opinions about where I should be headed. With all that, getting into the game and feeling like you’re moving ahead is certainly more tangible. A completionist like myself ends up chasing down more than a few green or grey quests. For me, this is especially try with the book-ordered epic quests, which I always try to run. Traditionally, massively multiplier online games have been about three basic gameplay pillars – combat, exploration and character progression. But with LOTRO, in addition to these they’ve added the fourth pillar to the equation; a story. That story leads you along with the action taking place in Tolkien’s books and helps to make the game seem more like Lord of the Rings and less like Kill Ten Rats Boars. Now, is this speed up a good thing? I think so. I have been a very casual LOTRO player, but this makes me feel like Moria and Mirkwood are not totally beyond my reach, even starting again from scratch. Some people, however, view askance any easing up on the difficulty of a game. Where do you stand on this? Is it a good thing or not? This entry was posted in entertainment, Lord of the Rings Online, MMO Design on May 13, 2010 by Wilhelm Arcturus. Good re-review. I love LOTRO, I got the lifetime sub on its first anniversary and recently did the Woot deal and upgraded to both expansions for $10. Now I just need more time to get to Moria. Do the story missions still require a group? That was pretty much why I stopped playing: it was tough to find someone to run the storyline quests with. All the book quests in the original content are now soloable. You get a buff that makes you more powerful so you can do the tough quests by yourself. @MuneMud – I started writing something about story being a key feature of LOTRO when the whole Derek Smart thing came to mind and I realized that it could easily be made to apply to the game. And LOTRO pre-dates SWTOR by a long shot. I’m on the lifetime sub as well, which has been a mixed blessing. I like that I can pop in whenever, but that I am not paying a sub means I tend to rank games I am paying for by the month above LOTRO for my time. I’m interested to hear your thoughts on 30-40 since I quit, restarted, and quit again with my champion feeling stuck in that level range. I loved the game until that point, but I felt like I was making absolutely no progress and wasn’t enjoying the zones I was playing in. I think a lot of it had to do with either having quests that were above my level or group quests. If I could get him into some new zones and on his way again, I’d most likely start playing again. I got the lifetime subscription back in the beginning. I went back to LotRO last fall for a few months and pretty much I had the same experience. I saw more of the game then I did the first time. And there was less annoyance in having to find a group. But still it was more fun to do the Epic Book quests with a few others. The whole “Story as a fourth Pillar” has always been amusing. Everyone thinks they are the first ones to really incorporate story in their MMOs. However “Story” is a tricky thing. So far, to create a story for characters to follow and experience, devs have utilized special instancing. Which makes games feel more “single player” then Massive. I still like the games, but they are much different then the open worlds of UO and old EQ. I think LOTRO has it pretty much just right. Not perfect, because I doubt that is possible, but I have always found it a very pleasant pace. @Veleric – Alot of people seem to find trouble with the 30-40 range, and I have read some suggestions that part of the reason for this might just be the areas one tends to level in in that level range, principally North Downs. It is such a huge region, with so much going on, that it is almost like folks just got bored. I can certainly see that, and I for one was very glad to finally get through to Evendim. Agreed with Veleric; I just got stuck at 32 (skirmishes were a real letdown for me.) I threw in the towel with my Captain and never logged in again; it took too long to level, and I never really felt like I was getting anywhere. And combat was slow. And that animations annoyed me. And housing was too expensive. And my guild sucked. Yeah. So in the end everyone is happy (sort of) must be a good thing then. @Klyff – There will always be changes to a game that allow the veteran players to have the ‘uphill both ways’ stories to tell. I don’t think those changes should be boosts to push people toward the level cap faster, though. To me, someone who wants to enjoy the journey and not just the destination, it doesn’t devalue dedication, it devalues content. WoW might manage to recover from this trend with their revamp of the original zones. I’m not sure. They will still have the problem of the level cap, though. Even if they don’t keep raising it in future expansions (though there are no indications they will give it up), 1-85 is a long haul. I’d be fine with that for myself, but with what seems to be the general belief that “the game starts at the endgame” (no contradictions there, right? :) ) Blizzard will probably look for ways to get people there faster again. This is why I’m in favor of a low level cap and horizontal expansion. Which I could go on about for a while, but I started off the topic of the original post and that would just take me farther down the road away from it. LotRO is still one of my favorite games at the moment. It falls into many of the traps of the “standard” MMO, but with the right kin it has been such an enjoyable time that I have been more willing to forgive things that would drive me from a lesser game. @Brian – I haven’t been on much in the last week, but if you see me on, send a whisper.